Note: The type species of this genus, M. nitens, has been shown to belong to the genus Smithora (West & Zuccarello 2009), so that our species should probably also be referred to Smithora. 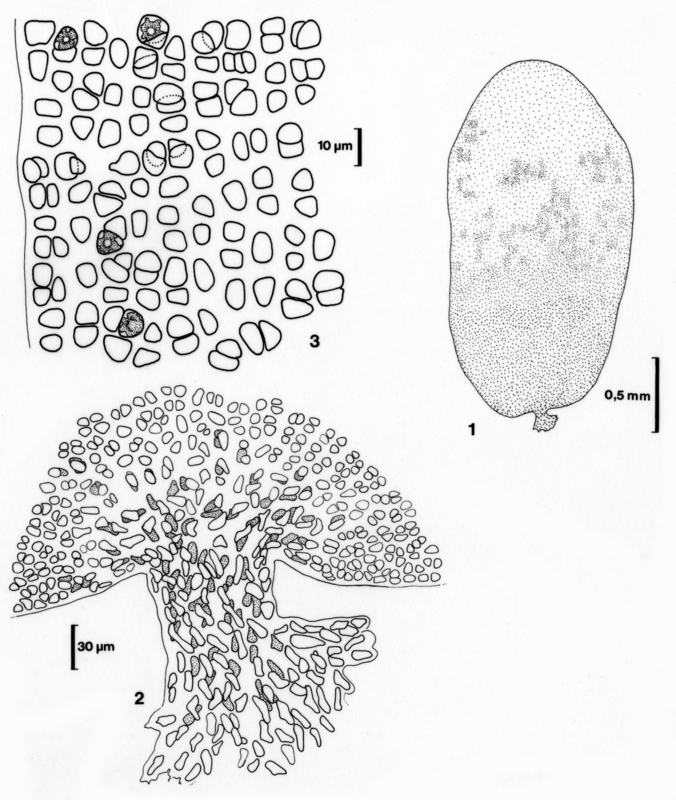 Plants with one to several shortly stipitate blades arising from a multicellular holdfast; cells of holdfast and stipe elongated but without rhizoids. 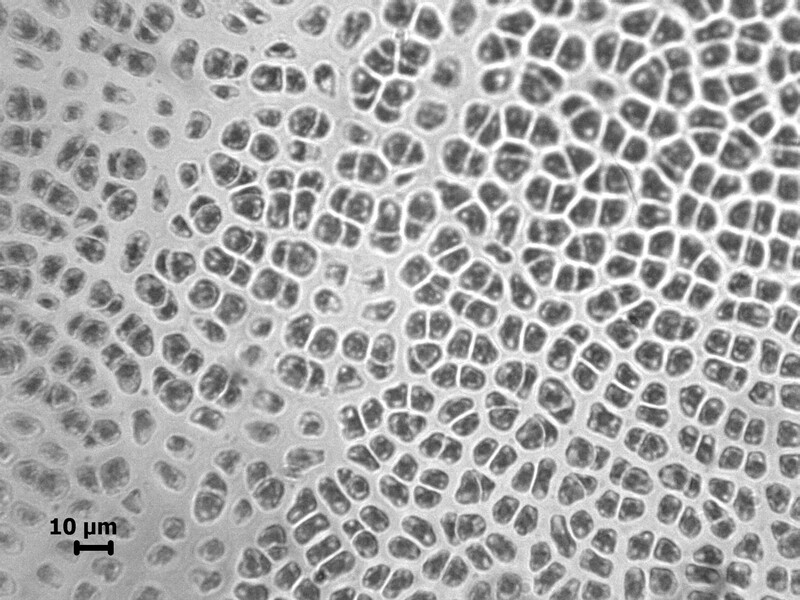 Stipe tubular, multiseriate; blades pale red, round to ovate, monostromatic, up to 10 mm tall, about 15 µm thick; cells rounded, 5-8 µm in diameter, with central stellate chloroplast and central pyrenoid. 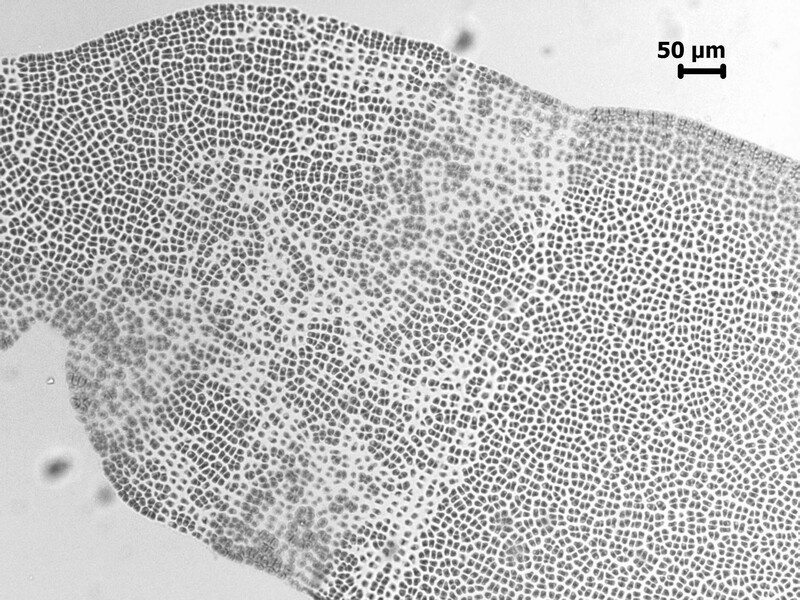 Reproduction by monosporangia formed in patches in upper half of blade by unequal division of vegetative cells. Epiphytic on various seaweeds in lower eulittoral and shallow sublittoral zones. Recorded from Cape Point to Kei Mouth (17-43). Type locality: Cape of Good Hope (just west of Cape Point), South Africa (Stegenga et al. 1997). Notes: 1. 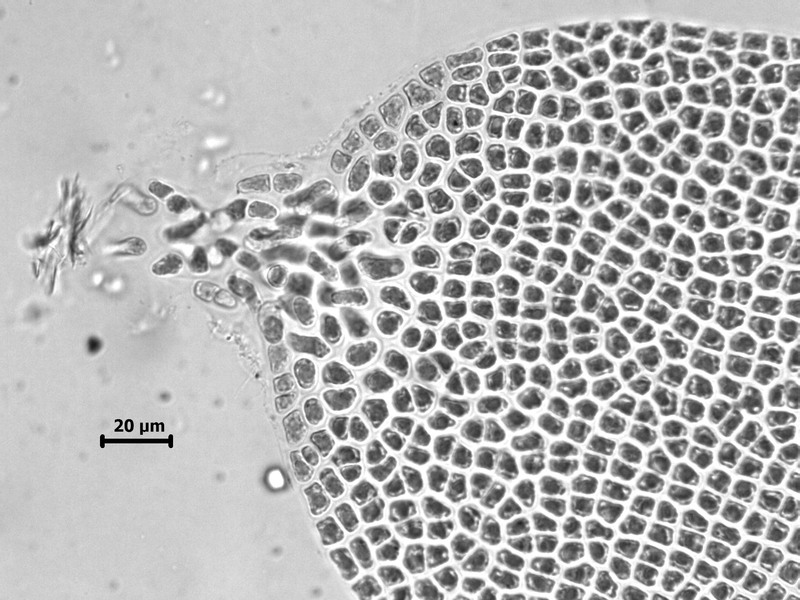 Plants are very similar to small Porphyra thalli among which they are sometimes found, but they lack “true rhizoidal cells in the basal structure” (Stegenga et al. 1997). They are also superficially similar to Erythrotrichia platyphylla but have a multiseriate stipe (Stegenga et al. 2001). 2. The only other recognised species of Membranella, and the type of the genus, M. nitens, was shown by the DNA study of West & Zuccarello (2009) to be conspecific with the larger species Smithora naiadum. The South African M. africana therefore requires molecular examination but should probably be transferred to Smithora: interestingly, that genus has not been recorded here. Membranella africana, microscope slide of whole thallus. Membranella africana, base of thallus. 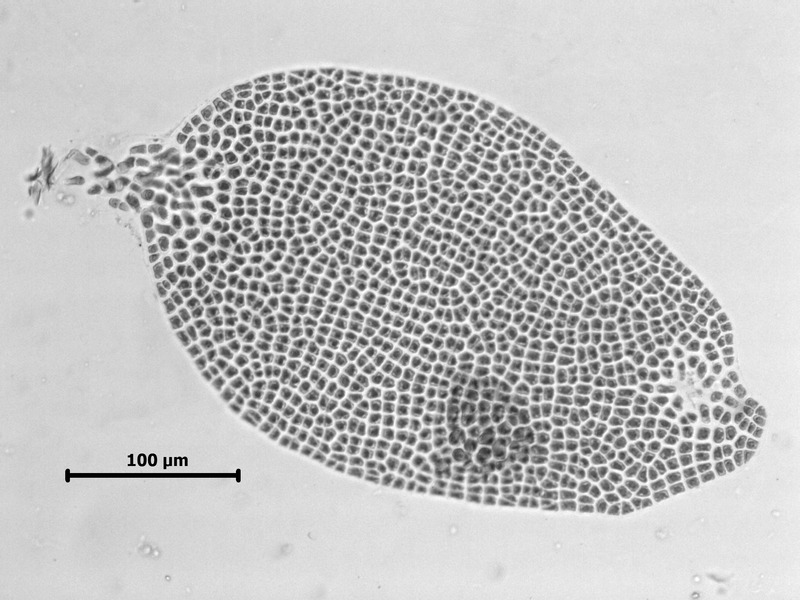 Membranella africana, monosporic tissue on left. Membranella africana, monosporic tissue visible on left as patchy areas. Membranella africana, 1. Habit of fertile plant. 2. Base of plant (note cylindrical “stipe”). 3. Detail of thallus edge, with formation of monospores. Reproduced from Stegenga et al. (1997). Stegenga, H., Engledow, H.R., Bolton, J.J. & Anderson, R.J. (2001). The distribution of the family Erythropeltidaceae (Rhodophyta) along the temperate Southern African coast, with the description of Erythrotrichia platyphylla nov. spec. Nova Hedwigia 73(3-4): 367-379.